Will it keep me going/can I stomach it for 20+ hours in a 100 miler? The aficionado‘s among you may have some deeper questions around the texture of the gel, whether or not it’s low GI, or what type of sugars they use, but in the main taste and how well we can stomach these things on the run is what matters. But it wouldn’t be a proper review without all the ‘other’ stuff, so here goes our best shot at giving you the low-down on one of nutrition’s newest entrants. Like most runners I know, my first contact with gels came mainly in the form of very high fructose-ladden rubbish, and I almost always used to suffer really bad stomach cramps on the run as a result. Sometimes I’d eat too many and be buckling over in a hobble. The flip side of this is that I’d then eat nothing at all, leaving myself in a dangerous position of not getting enough energy into my body and thus cramping. In short, I’m one of those people who despite having run ultras for over six years and countless numbers of them, I still struggle with my nutrition – and you know what, I still will. It’s a never-ending quest to get this right. Despite all the training and peak physical fitness you can find yourself in, nutrition on the day is still a hard nut to crack. Given this, what you put into your body is important as it can seriously affect race performance. As my intolerance for high-fructose ‘food’ is generally bad to diabolical, I’ve gone down the low GI route for the last two years or so. As such, my choice of nutrition is no longer based on what something tastes like, more so what the make-up of the gel is and for me, fructose is firmly out the window. The likes of Hammer and 32GI have served me well over the years, but I still don’t think I’ve really ‘nailed’ it yet’. I’m not claiming these guys have all the answers, but upon reading about the make-up of their gels I thought they might be onto something. The first thing that got me interested was the fact that these bad boys contains ‘fat’. A dirty word in running, but something I know a lot about. I’ve always thought a bit of fat was good for you on the run, and it seems these guys agree. Not only that, but another deciding factor was seeing the different make-up of the different types of sugars used in their gels. VFuel claim that it’s the world’s first endurance gel, so here’s a bit of blurb, about why that’s so and based upon our two important factors, taste and ability to stomach the thing. 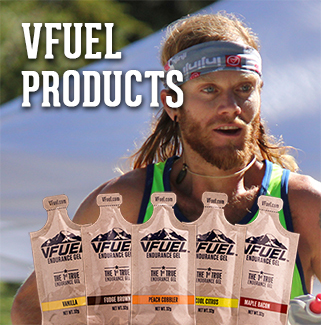 VFuel flavour their gel using natural sources. But this does make them slightly more expensive as a result. For example in their chocolate flavour they only use organic, non-alkalised, real cocoa powder and a hint of pure, real vanilla. There are no frills, no synthetic blending of ‘flavours,’ and no additives. VFuel claims to have tested hundreds of different ingredient sources to create their gels, which include testing ten different kinds of maltodextrin to make sure they get it right. 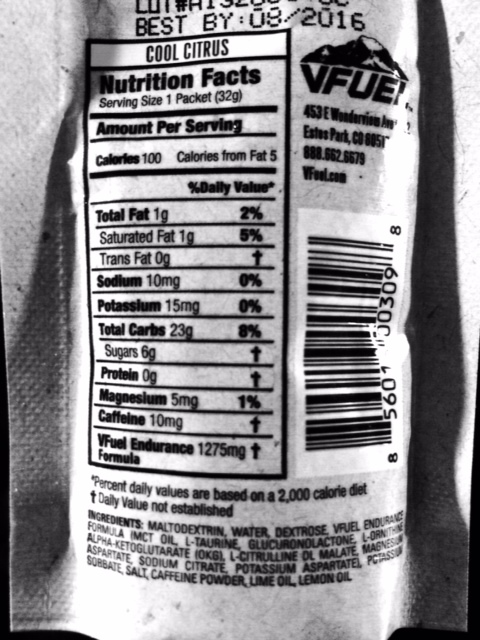 VFuel, like other energy gels on the market, starts with maltodextrin as the primary carbohydrate. But from there, they move off the ‘typical path’. Most other gels use fructose, or some sort of rice syrup or evaporated cane juice, all containing Fructose. VFuel uses Dextrose as its secondary carb, a more expensive option, but one that is easier to digest and has certainly been my experience to date with them. So does it work? For me personally yes. Given the issues I’ve had previously with other gel brands and the high-levels of fructose contained within them, VFuel is a blessing on the body. No massive highs or lows to date, just good sustained energy, which I’ve found with the other products I’ve mentioned but for me, it’s the taste where VFuel has a point of difference. Despite having a number of ‘sweeter’ options, the so-called sweetness really doesn’t permeate through your mouth or guts. 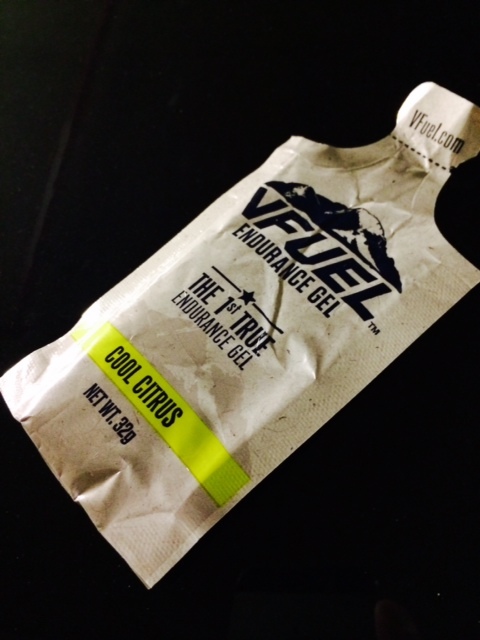 Whereas some gels can leave quite a sickly feeling in the mouth, I’ve found that VFuel just glides through. The consistency of the gel is very thin, which makes eating the thing pretty easy to get down and dare I say, enjoyable at times. I actually feel as though I’m eating something satisfying and not something that I simply need to get down my throat. One of the biggest drawcards for this line of gel is the range of flavours. Two words: Maple Bacon! Who the hell dreams up and comes up with a gel that is maple bacon flavoured?!?! At first I had mixed feelings about this rather bizarre concoction. What would it taste like? Would it leave a really weird taste in my mouth? The simple answer is no, there’s a weird sensation of sweet and sour, but no bad aftertaste. The same goes for the chocolate fudge brownie flavour – not sweet at all, in fact, remarkably ‘unsweet’ and very pleasant. Peach Cobbler, Cool Citrus and Vanilla feel slightly sweeter to me, but I guess it all comes down to your own personal taste buds and preferences if you’re looking for something sweeter. I’ve used these gels in a few races now (up to 100kms) and on a number of training runs (up to 50kms) over the last six months and so far so bloody good – I think these guys are onto a bit of a winner here. The only down side is the cost, which in Australia/NZ can be around $3-4 a gel. It doesn’t really make it a good option to keep training on them – which is kind of important too. Looking at it practically, a 50km training run could cost you around $30-40 in gels. That isn’t sustainable. If you’re in the US, it’s a different story with multi-packs priced at US$1.59 per gel, however I’m not sure of the shipping policies these guys have at the time of writing. I suspect that like most manufacturers of most goods globally, cost is based upon where in the world you reside and how much you can be fleeced for. There’s also no Australian distributor as far as I can tell, but one of our Kiwi cousins, Grant Guise at BCR is a stockist, but I know he’s out of stock right now. That’s because I bought him out of what he had left for this review! Check back in with him when he has some stock if you’re keen (June-ish), and before I badger him for some more! Review footnote: A sample pack of 5 gels was provided to Ultra168 for testing purposes. All other gels used as part of the review process were paid for.